Tech can survive in crowded niche by enabling brokers, not replacing them, firm says. The tool, called Smart Capacity for Truckers and Small Fleets, is targeted at those fleets with 10 trucks or fewer that haul about 80 percent of the country's freight, Reston, Va.-based Trucker Tools said Aug. 23. The application mirrors much of the functionality in the firm's previous product, called Smart Capacity for Brokers, that is integrated with many transportation management system (TMS) software platforms and streamlines brokers' workloads by applying predictive freight-matching and capacity connectivity software, according to Trucker Tools. Trucker Tools' launch of the product comes a month after the firm raised $4.4 million in a funding round from existing investors intended to support product development and customer acquisition. Launching software tools for the trucking industry can be challenging in a competitive market, Trucker Tools founder and CEO Prasad Gollapalli said in an interview. In recent months, venture capital funding has flowed to freight matching apps like Convoy, Cargomatic, and Transfix, while Uber Technologies Inc. recently said it would double the investment in its UberFreight brokerage division. "We're in a period of app overload," Gollapalli said. "Drivers are going through a phase where they don't want to download another app. They're going to settle on just one, two, or three." 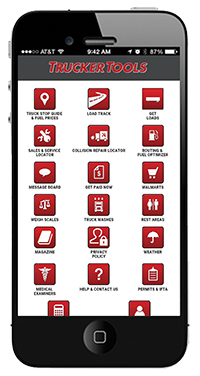 But Trucker Tools says its original product, the Trucker Tools Mobile Driver App, has been downloaded by more than 500,000 truckers since its 2013 launch, creating a critical density of users that makes the tool valuable in a marketplace struggling with historic capacity constraints. Drivers use the mobile app to manage 16 different trip-planning variables, including recent enhancements such as route planning and fuel optimization, a truck stop and rest area locator, load tracking, and document scanning, the company says. In addition, the app connects to the firm's Smart Capacity platform, allowing drivers to look at loads while supplying brokers with critical data such as real-time updates on available capacity and current location, Gollapalli said. "Our focus is on enabling the broker, in contrast to those coming into the market with a pure technology play to disintermediate the broker," said Gollapalli. "We believe brokers bring a knowledge of the marketplace and support important relationships with carriers and shippers." Feedback: What did you think of this article? We'd like to hear from you. DC VELOCITY is committed to accuracy and clarity in the delivery of important and useful logistics and supply chain news and information. If you find anything in DC VELOCITY you feel is inaccurate or warrants further explanation, please ?Subject=Feedback - : Trucker Tools offers load-matching product for small fleets">contact Chief Editor David Maloney. All comments are eligible for publication in the letters section of DC VELOCITY magazine. Please include you name and the name of the company or organization your work for.